Menke S, Bohning-Gaese K, Schleuning M. 2012. Plant-frugivore networks are less specialized and more robust at forest-farmland edges than in the interior of a tropical forest. Oikos. Abstract. Forest fragmentation and local disturbance are prevailing threats to tropical forest ecosystems and affect frugivore communities and animal seed dispersal in different ways. However, very little is known about the effects of anthropogenic forest edges and of local disturbance on the structure and robustness of plantâ€“frugivore networks. We carried out focal tree observations to record the frugivore species feeding on eight canopy tree species in the forest interior and at forestâ€“farmland edges in a little and a highly disturbed part of a Kenyan rain forest. For each frugivore species, we recorded its body mass and its forest dependence. We examined how forest edge and local disturbance affected the abundance, the richness and the composition of the frugivore community and tested whether forest edge and local disturbance affected plantâ€“frugivore networks. Abundance and species richness of frugivores were higher at edges than in the forest interior. 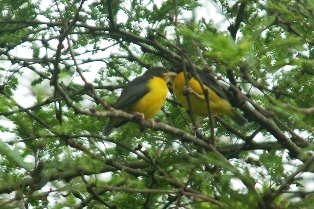 Forest visitors and small-bodied frugivores increased, while forest specialists decreased in abundance at forest edges. The changes in frugivore community composition resulted in plantâ€“frugivore networks that were more connected, more nested and more robust against species extinctions at forestâ€“farmland edges than in the forest interior. Network specialization was lower at forest edges than in the forest interior because at the edges plant specialization on frugivores was very low in small-fruited species. In contrast, small-fruited plants were more specialized than large-fruited plants in the forest interior. Our findings suggest that forest-visiting birds may stabilize seed-dispersal services for small-fruited plant species at rain forest margins, while seed-dispersal services for large-fruited plant species may be disrupted at forest edges due to the decrease of large-bodied frugviores. To assess the ultimate consequences of bird movements from farmland to forest edges for ecosystem functioning, future studies are required to investigate the seed-dispersal qualities provided by forest-visiting bird species in the tropics. This study was conducted in Kakamega Forest, Kenya, from January to March 2009. Six weavers were included in the list of frugivores: Baglafecht Weaver Ploceus baglafecht, Brown-capped Weaver Ploceus insignis, Black-necked Weaver Ploceus nigricollis, Compact Weaver Pachyphantes superciliosus, Dark-backed Weaver Ploceus bicolor, Vieillot's Black Weaver Ploceus nigerrimus. Photo: juvenile and adult Dark-backed Weaver.